Customers who arrive at Thunderpaws Pet Shoppe in Ketchum when 16-year-old Calder Zarkos is working could be greeted with a strange sight: a pigeon cuddling with a human. That pigeon is named Hubert, a white and red homing pigeon that Zarkos has raised from an egg and who has had very little contact with other pigeons. "If you could see it, your heart would melt," said Roberta Blodgett, whose lovebird goes to daycare at Thunderpaws, where she first met Hubert and Zarkos. "This pigeon doesn't even know he's a pigeon. You can cuddle him and coo at him and he loves it." 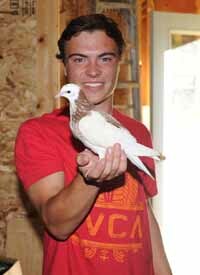 Zarkos, a Community School junior, has been bringing up Hubert by hand since he was born in Zarkos' pigeon loft this spring. Early one spring morning, Zarkos entered the pigeon coop to find Hubert in his nest, freezing and abandoned. "I guess the mom got scared off of him," Zarkos said. "She didn't sit on him one night, and I found him in the morning." Raising a pigeon by hand has its challenges, among those being feeding. Zarkos said he raised Hubert based on previous reading and what he's gleaned from other pigeon breeders he knows. "There wasn't really a formulated step-by-step raising for him," Zarkos said. "It was just whatever I felt was necessary to keep him going." Necessary measures included feeding Hubert a mixture of Purina pigeon pellets and water. Though now that the little bird is weaned, Zarkos' mother, Jody, said the high school student has been feeding Hubert just as his mother would. "Calder's been feeding him out of his mouth for weeks and weeks," she said. "He's so dedicated to those birds." Hubert is one of Zarkos' flock of 34 pigeons that live in a coop behind the family's Board Ranch home. Half the pigeons are "rollers," stunt pigeons that instinctively roll and do flips while flying, a trait that evolved as a way to avoid predators. The other half are homing pigeons, trained to return home at the sound of a whistle. Homing pigeons are famous for being the "carrier pigeons" of yore, mostly notable for their role in carrying important messages and airmail. A homing pigeon named Cher Ami was even awarded the French Croix de Guerre for delivering 12 important messages while severely injured in World War I. Three pigeons won the Dickin Medal for carrying messages that saved lives during World War II. Use of pigeons for carrying messages has fallen off in more recent times, but numerous associations across the country are dedicated to the breeding, showing and flying of these birds. Zarkos first became interested in pigeons three years ago when visiting pigeon expert Jim Jenner in Montana, the uncle of a close friend. Jenner has made several documentaries about pigeons and pigeon racing. When Zarkos returned home to Ketchum, he contacted a Bellevue pigeon breeder who helped him fill his coop. Jody Zarkos said she was less than thrilled about her son's new hobby. "I'm not a bird fan at all, so I was like, 'Ooh, I don't know about that,'" she said. "Then I went away for a weekend and when I came back, there was a coop in my backyard." Jody said she's mostly made her peace with the birds since the coop appeared three years ago. "He only flies them at certain times, so it's not like they're wandering around the house or anything," she said, adding that her son's enthusiasm helped win her over. "It's hard to say no when they are that excited about something." Backwoods Mountain Sports owner Andy Munter and his wife, Janet Kellam, former director of the Sawtooth Avalanche Center, live a few doors down from the Zarkos family, and Munter said they've greeted the pigeons with enthusiasm, too, thanks in part to Zarkos. "It's really neat that a kid like that has a passion that deals with such responsibility," Munter said. He said he and his wife haven't had any adverse affects from the pigeons, either with noise or other problems. "Maybe their next-door neighbors have a poop problem, but we don't," he said with a laugh. "It's a real pleasure to drive home and see a flock of 30 to 40 pigeons, the sun glistening off their wings, knowing they're going home in a few minutes." Zarkos said that contrary to pigeons' reputation, his birds are far from the "rats with wings" that city-dwellers are used to dealing with. "They're not as dirty as people see in cities," he said. "They give themselves baths and they preen their feathers." The pigeons are also remarkably friendly, he said, and more than willing to approach humans—especially if food is imminent. But in that respect, Hubert is more lovable than others. "Most pigeons will come up to you, but not like he does," Zarkos said. "He'll land on your shoulder, you can pick him up and walk around with him, and it doesn't bother him." The bird's current abode is a small box in the Zarkos' garage, but he's soon to move into his own small house near the other pigeon coops. Zarkos said pigeons flock in the air, but are fiercely territorial when at their home loft, which could make it difficult for the orphaned Hubert to join the flock. Zarkos said Hubert will be free to join the other birds if he wants to, but he may not choose that path. Hubert has only encountered Zarkos' other pigeons twice, which may explain his affinity for humans. "Either he thinks we're pigeons or he's us," Zarkos said.